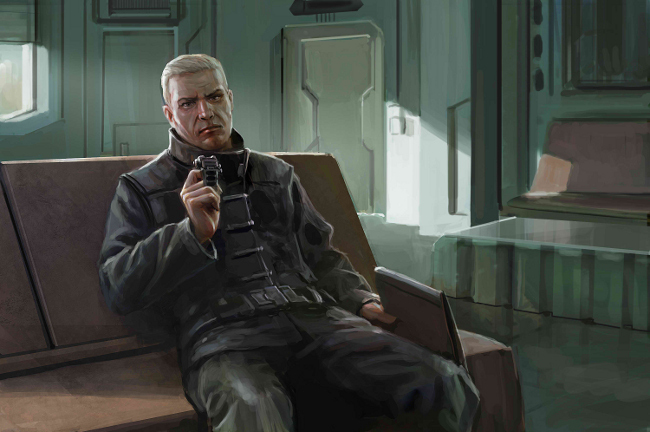 Tibus Heth, Executor of the Caldari Providence Directorate and de facto leader of the Caldari State, sat alone in the waiting room of Dr. Yoshun's Corporate & Family Practices. He fanned himself with a plain brown filing folder that bore neither label nor seal. The breeze it created was slight, though it was a gust compared to the pitiable whimper of the room's climate control unit. He shifted his weight to his right side as he pulled out an old metallic watch. The case was smooth and cool to the touch, its contours blemished by minor scratches and the occasional dent. The back still bore a fading decal that read, "Employee of the Month." He stared at the ticking hands, blinked himself out of a tired trance, and returned the watch to his pocket, a cycle he had completed twelve times during his wait. Despite his history with Caldari Constructions, he was fond of his non-monetary reward. It was a good, mechanical watch. Tibus always preferred things he could fix himself. After stretching in his chair with a grunt (answered by a small series of hollow pops from his back), Tibus opened the manila folder. Inside was a series of monochrome reports printed on cheap white paper. The calm, pristine lines of standard Caldari report formatting were completely negated by Tibus's numerous inline notations and marginal scribblings. Lines crossed between sections; questions scribbled in the margins were answered by other, more frantic questions. Everything suggested connections, but none were made. The first report profiled former Gallente president, Souro Foiritan. Foiritan was the perfect model of a Gallente politician, averse to direct , especially military, action but skilled enough with words to thwart the efforts of his enemies. His recent resignation had taken the intelligence community by surprise. Only its timing suggested any sort of connection, especially with the purchase of his homeworld, Intaki, by the Ishukone. A second report picked up that story. It listed the movements of Ishukone ships, personnel, and other assets over the past year. The megacorporation, and its CEO, Mens Reppola, were Tibus's greatest internal political enemies. When the Caldari militia held complete dominance of Black Rise and development rights were auctioned off, Ishukone had bid only on Intaki. More curiously, they had contracted the mercenary company Mordu's Legion to police the system. Conspiracy theories were stranger still, but no evidence could be brought to bear. The final report in the folder, marred by a web of Tibus's notes, detailed the new Gallente president, Jacus Roden. The majority of the report was long outdated. Intelligence was playing catch-up. Roden's life was well documented until his retirement from his position as CEO of Roden Shipyards. The trail went completely cold there, picking up again only with Roden's recent meteoric rise back into the public spotlight and the presidency. Tibus pinched the bridge of his nose. He read the reports more than a dozen times, each time realizing more connections. He had long suspected that Foiritan and Reppola conspired against him, but Foiritan's fall and Roden's ascent did not fit. All three men were intelligent and immensely capable; nothing they did was accidental. The only way it made any sense to Tibus was through an intricate conspiracy supported by a network of Gallente agents operating within the State: The Federation use Intaki as a way to funnel their spies into the State; Foiritan resigns as a distraction; and Roden assumes control of the Gallente government, plausibly clean of the Intaki affair and the most powerful man in the Federation. Tibus knew it sounded insane, but he also knew such machinations were possible. The Broker proved that idea. Flushing those agents out would be a painful task. Tibus's political power was not absolute. If he targeted Ishukone and questioned their loyalty without any hard evidence, the other megacorps would turn on him. He could authorize a State-wide inquiry to save face, but that would consume time and energy that could be spent elsewhere. How much could he risk on suspicions alone? A knock at the door startled Tibus out of his headspace. He scrambled to replace the documents back in the folder. A nurse peeked her head in from the adjoining hallway. "Sir? Mister, ah…" she trailed off, taking another puzzled glance at the appointment list she carried. "Mister Adar?" "Sorry. Thought you looked like Tibus Heth for a second. Dr. Yoshun is ready to see you." Tibus sat on the small table in the examination room. The room was spartan and slightly too cold to be comfortable (a practice Tibus had found uniformly maddening in all doctors’ offices). A canned smell halfway between fresh flowers and mouthwash permeated the air. The only decoration was a small poster of a human heart attached to a time bomb, with the accusing phrase, "PREVENTION SAVES LIVES," in bold beneath it. Standing above Tibus was Dr. Yoshun. He was a younger man with dark hair, and his long, white coat bore the Caldari Constructions logo on either sleeve. It had only been five years since Yoshun took over as the CC physician for the district, but the pressures of maintaining the practice on his corporate budget had already aged him well beyond that time span. Tibus noted that, regardless of Yoshun's degree of experience, he had perfected a disapproving scowl. "Tibus, I'm flattered that you want to stick with your old planetary physician and all, but you haven't had a proper checkup since, you know, everything. And insisting that your appointment not push out any of the other patients is borderline treason. You're the most powerful man in the State." The older man took the berating in stride. Their personal dynamic was established during Tibus’s years with the company. Yoshun was one of the few loyal company men Tibus always trusted. "I'm a citizen of the State first," he replied. "I don't deserve preferential treatment." "Don't give me that crap. Your health is not a damn political statement. These tests should have been run a long time ago." Yoshun raised an admonishing finger. "And before you say it, I don't care how busy you've been. Getting the blood results back took two days. Two days! If you had just one blood test and two days available a year ago, everything could have been different." Tibus adopted a skeptical face. "You're being melodramatic, Yoshun. I've been exercising regularly. I'm sure as hell eating better than I ever did in the company cafeteria. The pain in my leg comes and goes, but other than that I feel—"
The room fell silent. The climate control droned on. Half a minute passed before Tibus showed any further reaction. "Derj's disease?" "It's also known as exotic tissue sedimentation, or 'miner's disease.'" "I goddamn know what it is!" Tibus blurted. He clenched and released his fists several times, trying to control himself. When his composure returned, he asked, "How far is it?" Yoshun pulled out his battered datapad, fighting briefly with the slow machine. "It's stage three. Deposits have started to form around neural tissues. Needless to say, your blood's full of the stuff. If we had detected it earlier, we might have scrubbed you of it in a month. As it is, we can treat most of your symptoms, but you'll never really be cured." "Is it...." Tibus trailed off, struggling with his mouth to form the word. "No. At least, not technically. Look, with the kind of resources you have at your disposal, there's no reason you couldn't live a full, natural lifespan. This never has to reach stage four. But — and this is a large 'but' — the deposits that have already developed interfere with brain mapping. They corrupt the results in unpredictable ways." "If you were to ever attempt to clone, there's a strong probability of permanent and irreversible neural damage. The worst-case scenario, and not an unlikely one, is that your new body would just never wake up." More seconds passed as Tibus processed his new fate. He felt the watch’s subtle ticking in his pocket. "How?" "Augumen exposure. You most likely came into contact while moving construction materials for the company. "Augumen is illegal for construction use. Hell, it was illegal before I took over." "Yeah, it was illegal. But augumen is also a hell of a lot cheaper than pyroxeres, and it's damned easy for inspectors to miss the difference." Tibus's gaze hardened. He knew the answer to his next question, but asked anyway. "You're certain the company did this?" "I don't have any proof," Yoshun set his datapad aside, "but yes." Executor Heth's security entourage immediately greeted him as he exited the small practice. They were all wearing the latest in personal armor, shiny and clean in the evening sun, contrasting heavily with the weather-worn building. If his men tired of waiting outside, they made no mention of it. Jinyo, a tiny man in an over-starched suit, Heth's acting aid and ever the functionary, hurried to the executor's side. He was madly tapping on his top-of-the-line KK datapad, juggling dozens of meetings and mails. "I hope everything went well, sir. I know you prefer to keep things humble, but we really should find you better and closer health care. In the past seven hours, eighteen new issues arose that require your attention." "Yes," he replied, "I'm sure." Heth began walking briskly to the parked, nondescript Speeder they had arrived in. His entourage hurried behind. Their leader was walking a brisker pace than they were used to keeping. All of Heth’s old and new angers and frustrations mixed together, merged, and fueled a resolve he had forgotten since the first day of his tiny workers' revolt. Even his limp felt lessened. "Jinyo, I have new orders." "Yes, sir?" The tiny man made a dozen taps on his datapad. "First, launch an investigation into Caldari Constructions’ use of augumen in building materials, going back ten years. No excuses, just names or heads. Second, I want a full-time, dedicated personal physician. Schedule regular checkups, tests, the whole gamut." Heth put his hand in his pocket and felt the watch’s cold, dented case. "Third, Jinyo, the Caldari people need to know their government is healthy. I want a list of our most loyal, incorruptible officials and investigators, Navy background preferred. Weakness and timidity have allowed an infection to grow within the State. We will burn it out."